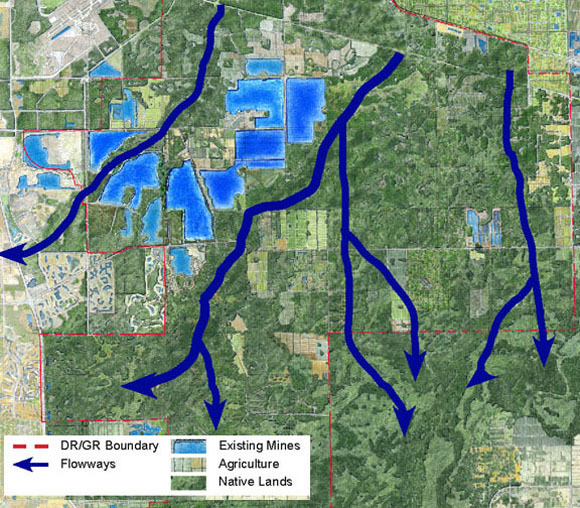 DR/GR stands for density reduction – groundwater resource. It is a large area of land (over 80,000 acres) just east of Estero that was established jointly in 1990 by the State of Florida and Lee County with the specific purpose of protecting the principal water supply for most of Southwest Florida including both Estero and Bonita Springs as well as Fort Myers, Cape Coral and even areas of Naples. The density reduction name refers to how land was to be developed in this precious natural area- only one home per 20 acres of land. 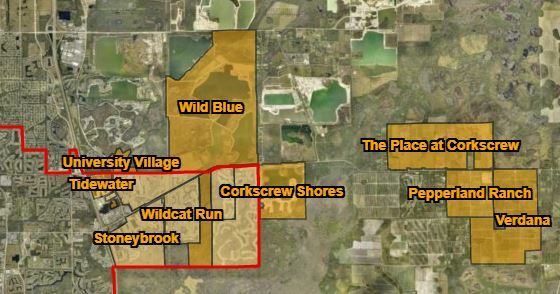 For several years, the 5 person Lee County Board of County Commissioners has encouraged development of the DR/GR alleging that development will not harm the groundwater resource property. Developers have successfully lobbied the Board and produced so called scientific studies that support a pro development position. Studies done by several independent agencies including FGCU show just the opposite effect predicting that development in the DR/GR could cause it to lose its ability to safely collect rainwater, leach it down to the main aquifers that store our water and thereby permanently harm our water supply, not to even mention the adverse effect on our wild life habitat of which the DR/GR is a principal part. The Lee County Commissioners have quietly pursued development which has lacked transparency and now seek to eliminate something called MAP 14 which defines the area and restricts development. The effect of this would be to open lime rock mining and development in this precious area. Lime Rock mining is one of the harshest forms of activity that a land area can experience. They allege that Lime Rock supplies are dwindling, and new mines need to be opened. Again, independent studies note that there are adequate supplies of Lime Rock for at least 25 years. Is the DR/GR area being developed? Yes, there are new developments under construction or pending that total 4,450 units that directly impact the DR/GR area. Pepperland Ranch plans 700 homes, and The Place at Estero is already building 1325 homes and Wild Blue has started another 1000 units. Verdana approval is pending for another 1425 units. Drive 7 miles East on Corkscrew Road past I-75 and see for yourself. The one home per 20 acres is being replaced by much denser construction, as many as 12 homes per acre, this does not include all impervious surfaces, roads, parking lots, etc. etc. nor does it include the commercial, educational and retail development that will be necessary to support all the residential construction. Your water supply is at risk – traffic is at risk – public safety is at risk but unfortunately, the Village of Estero has no authority to regulate this reckless development in unincorporated Lee County to our immediate east. Since Corkscrew Road is the principal access/egress, we are the victims not the benefactors. Write the Lee County Commissioners and demand that they stop development of the DR/GR and maintain Map 14 development restrictions that preserve and protect our water supply. Attend their meetings and voice your concern. They meet at 9:30AM on the first and third Tuesdays of each month in the Lee County Building in downtown Fort Myers. There is always a public input opportunity required by law. The developers have very, very deep pockets so a grass roots public campaign must occur – you are urged to share this information as widely as possible. Many Estero communities have launched efforts like this to inform the public and urge public action.